Raising your body temperature can also lift your spirits, so there’s no better cold-weather antidote than the intense heat of a sauna or hammam, two of the oldest detox practices in existence. Escape the grey skies, relax with a soak or expert massage, sip a soothing tea and wait for spring to roll around again. In the swanky Boulevard de Waterloo, Spasiba is a haven for pampering and exclusive treatments. The plush surroundings invite instant decompression. In addition to the sauna, hammam and Asian-inspired relaxation space, seven themed rooms are adapted for varying treatments, from typical floor-based Asian massages to rooms for couples and ones adapted for body scrubs. Its signature facials are medical-based, with technicians using Biologique Recherche products when analysing and adapting each treatment. If it’s simply a warming wind-down you’re in search for, access to the spa is €35 for two hours. It’s one of only two Belgian outposts of the global French spa brand Deep Nature; the second is in the nearby four-star The Hotel. Another luxury urban hideaway is Serendip Spa, a wellness centre offering massages and treatments in busy Place Stéphanie. With its nextdoor yoga studio, it promises clients time out from their schedule and a body and soul makeover. Serendip is the ancient name for Sri Lanka, so a southeast Asian vibe pervades, and some of the practitioners come from this part of the world. Natural products are used in therapeutic massages (from €65), which include Indian-inspired Ayurvedic, Balinese, Thai, Tibetan and Asian fusion, as well as detox, aromatherapy, peels, scrubs and wraps, plus spot treatments for back, shoulders, neck and feet. 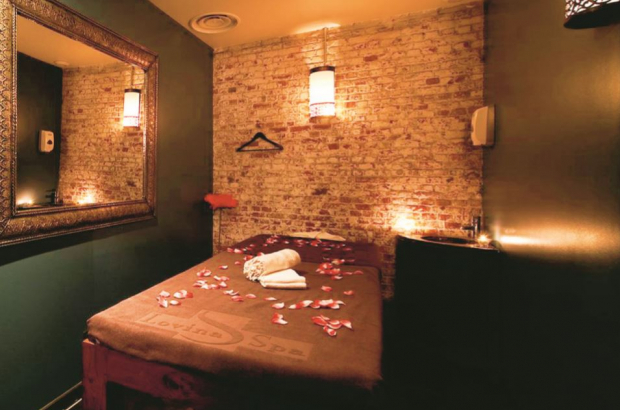 For another Asian experience, Lotus Spa in the Maelbeek area offers therapeutic Thai, Balinese, Ayurvedic, aromatherapy, acupressure and deeptissue massages. Thai Ô Siam in Evere has full spa facilities in addition to its menu of massages (from €60). The indoor and outdoor pool, sauna and hammam, garden and lounge area cost €125 for two people for two hours. Thanks to Brussels’ multicultural population, there’s a good mix of oriental spas in the city. Arab hammams have their tradition in public bathing and remain gendered spaces and hives of social activity. Lovina Spa in Tour & Taxis is a high-end example; an experience straight out of the Arabian Nights. Its authentic hammam will transport you to Morocco while additional services include massages, beauty treatments and a hair salon. Take your own massage glove and traditional black soap, which softens, cleans and exfoliates, or buy them there. There’s generally exclusive access for women during the day, men in the evenings. Spa entrance is €25. Riad Hammam in Schaerbeek is a neighbourhood spa. It has separate entry times for men and women, and offers body scrubs, soaping and lymphatic treatments. Douniazad in Chaussée d’Haecht, a traditional hammam offering oriental rituals and a beauty space, serves only women, while a Moroccan retreat awaits in the EU quarter at Le Johara wellness centre. Come for Oriental rituals, beauty treatments using Le Sens de Marrakesh products and traditional hammam scrubs.